Poll results: What did you think of the Microsoft Surface Pro 3? Just two days ago, Microsoft introduced to the world its third addition to the Surface Pro line with the Pro 3 -- a tablet that attempts to melt away the perceived distinction between the laptop and tablet form factor. Indeed, the Surface Pro 3 is a full-fledged PC, nestled in the relatively compact body of a 12-inch tablet. Powered by Microsoft 8.1 Pro and Intel Core processors (there are as many as 5 different versions), this slate is no joke, and it's mainly aimed at creative professionals and tech hobbyists at best. That's not surprising, considering the steep price tag on the thing -- it starts at $799 for the least potent model, and shoots up all the way to $1949 for the most powerful one. Obviously, that's quite some dough for a tablet, though the Surface Pro 3 isn't just any tablet, now is it. In fact, looking at the results from our poll aimed at gauging your feelings towards the fancy Microsoft gadget, many of you tend to agree. Put it numbers, out of the 2363 people that cast their vote, 27.3% are bananas about the slate. 48.67% of voters also dig the new gizmo, though the price tag is a bit much for them, while the remaining 13.71% consider it obscenely overpriced. What did you think of the Microsoft Surface Pro 3? Take my money, I need it NOW! It's a superb product, but I still prefer a laptops with tablet functionality to tablets with laptop functionality. XPS 12 vs PRO3, XPS starts at 999. thats 200$ more than the PRO3 which starts at 799$, if you really want the cheapest option. XPS is thicker, heavier. Doesn't have built in chip for the pen that can be used for graphic designers with over 1000 levels of sensitivity. 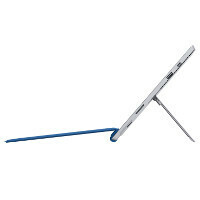 Has a moving part that if it gets broken you are screwed as it wont be able to transform from laptop to tablet. In worst case scenario the PRO3 hinge will get broken which you can easily fix with anything to hold it back while on desk. The cheapest XPS comes with only 80gb SSD, while PRO3 starts 200$ less and with 128gb SSD. The list goes on on. Seriously this thing is a total ultrabook killer. 250 levels of sensetivity, my bad. Great product for some people, not for me though. Love it, it's perfect! Dragon dictation ftw! Who needs a keyboard? I would need one to write a long novel or something, but the onscreen is just fine for the moment. Bluetooth is there to link up my bluetooth keyboard if need be. That is what dragon dictation is for (duh) 120 wpm, can you type that fast? No? Then why use a keyboard when dragon dictation is superior? Microsoft went away from the high quality Wacom pen and is using a cheap N-Trig pen now. I wonder how many tablet users will not buy the new Surface because of this. Samsung uses the superior, but a little more expensive, Wacom technology, even on their $400 tablets. I have had tablets with N-Trig digitizer and touch (HP Slate 500) and Wacom digitizer and touch (Thinkpad Tablet 2) in addition to older Wacom tablets without touch. While N-Trig got better on the 500 with a series of driver updates, it never approached the rapidity and fluidity of Wacom. Quick inking would too often result in broken lines. N-Trig may have gotten better but, if I was looking for a stylus tablet, I'd wait for reviews before I bought N-Trig again. That said, for me the new Surface is just too big and heavy. I was really hoping for a mini annoucement. +1 to someone actually use both. Me too, it seems too good to be true right now. Love this but still too much money & not enough options like where is a i3 128gb version??? Will keep using my 10.1 Tablet & preferred 15" screen laptop. Google's chrome book pixel is more expensive than the cheapest Surface Pro 3 but arguably gives you less for your money. When 70% of poll results show that consumers are unable to afford, or feel your product is over-priced, or are just unimpressed, you have a problem. and yet it is the same people who go wet over a 800$ inferior droid tablet.... It is not a problem it is people with an ingrained idea and nothing more. Just read the comments on most MS articles...you get the idea. I originally chose take my money, but after realizing that this thing doesn't even have LTE, I am now unimpressed. Hopefully the next one does, as I am looking to replace my iPad 4 in the near future with either the upcoming iPad Air 2, Galaxy Note Pro 12.2 LTE or a W8 tablet, and LTE is a must. I'm also a little disappointed at the Surface's gaming abilities, from what I've read there isn't much out there. That's a shame. There is NO possiblity to put there more powerfull video card. BUT it still offers more in case of gaming than any other TABLET on the market. Lack of 3g/lte modem is for sure a con. As for me, surface 3 pro is asbout 20% too expensive (for version with i5, 8GB RAM and SSD 256 GB). I will buy ultrabook. I think it's an amazing enterprise product. The ability to move about an office, head to meetings, go to someone's desk, run presentations, and do all of your actual work on a single device is beautiful. I'm not convinced that it makes for a compelling consumer product though. But in business, it's one of the best products available for a forward thinking office environment.